I was previously noting that the Sahara desert is slowly turning green. 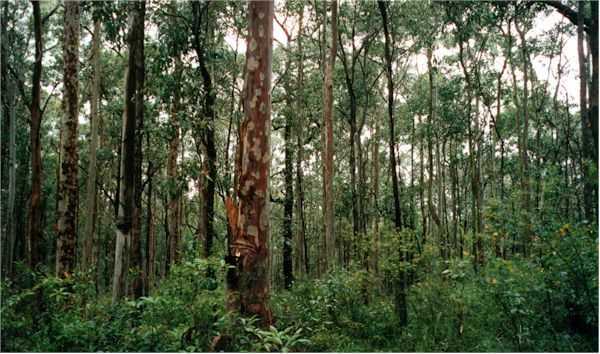 To a new study hurrying the process and extending it to the Australian outback by planting eucalyptus trees (left) could absorb our global CO2 emissions. Indeed this geoengineering idea would absorb eight billion tons of carbon a year. But we shouldn’t forget that like with any geoengineering project this would need huge funds and many technical difficulties would arise. All this is pretty interesting but for two trillion dollars per year, I believe that investing in the protection of existing forests would prove as profitable. For more than a century, a few scientists have occasionally daydreamed of transforming much of the Sahara desert green, with a lush inland sea or vast tracts of farmland. Now researchers say they have actually found a way to make such a scheme work with forests across the desert–and to slow climate change in the process. (…) They envision desalinating seawater from the neighboring oceans and bringing it inland using aqueducts and pumps. Drip irrigation–plastic tubing to water the trees’ roots–would minimize the amount of water lost to evaporation and seepage into sandy soils, allowing trees to prosper in areas that are parched today. According to climate simulations to be published next month in the journal Climatic Change, the forests would cool the Sahara by up to 8°C in some areas. “Eucalyptus grandis and a large number of other tropical tree species are heat-tolerant, so long as they have an ample supply of water in the root zone,” Ornstein says. The tree cover would also bring more rain–about 700 to 1200 millimeters per year–and clouds, which help reflect the sun’s rays back into space. The scheme could also work for the arid Australian outback, the team reports. Ornstein says that if most of the Sahara and Australian outback were planted with fast-growing trees like eucalyptus, the forests could draw down about 8 billion tons of carbon a year–nearly as much as people emit from burning fossil fuels and forests today. As the forests matured, they could continue taking up this much carbon for decades. The project wouldn’t be cheap. Adding up the costs for building, running, and maintaining reverse-osmosis plants for desalination and the irrigation equipment, the researchers put the price tag at some $2 trillion per year. (…) Planting these forests might have side effects. The increased moisture could trigger plagues of locusts in Africa, just as the odd wet year does now. It could also dampen existing soils, stopping iron-rich dust from blowing off the Sahara and into the Atlantic Ocean, where it nourishes sea life, the study points out. Once again, this is interesting and somewhat comforting to know there is a natural way to improve our situation if climate change became even more worrying. I believe nonetheless that we should work on further decreasing the amount of deforestation like Brazil is doing. One key area which is thankfully starting to get more attention, if not action, in terms of combatting climate change is preservation and restoration of ecosystems. In fact The Economics of Ecosystems and Biodiversity project is saying “natural systems represent one of the biggest untapped allies” in combatting climate change, because of their carbon storage potential — and that incorporating funding for forests in a global climate deal should be a key priority. This is much more serious options and would prove much more beneficiary. yes very much true Eucalyptus, Azadirachta indica, Ficus religiosa these are the few species which are good pollutant adsorbents and thus attenuates its level too as well as these are important bioindicators. Many thanks Rupika for your comment ! I see you are quite good in botany, which is far from being my case. Congratulations and keep up the good work ! Very good article. However, economic equation does not take into consideration the growth factor. Ones the forest matures, it will need much less water (if nothing at all) to maintain. Additionally, ones established, much larger trees can survive in this forest, such es sequoias… and they will grow large with the roots being so deep that everything around it won’t matter. Thanks Scott for your comment and your insight.